Wrexham's new striker Louis Moult says he wants to help get the team back into the Football League after completing his move from Nuneaton Town. Moult, 22 ended up as Boro's leading scorer with 17 goals last season. He is reunited with Wrexham boss Kevin Wilkin, who took him to Boro in 2013. Moult said: "My goal is to get back into the Football League and I want to do that with Wrexham. The set-up, the Racecourse - it's fantastic and Wrexham should be in the Football League." Moult, who started his career at Stoke and made a Premier League appearance for the Potters in a 1-1 draw with Burnley in March 2010, was offered a new deal by Nuneaton but was keen on the move to north Wales. "From day one there was never any doubt - I was going to come here - it was just sorting a few things behind the scenes that needed to be sorted. But the main thing is I'm a Wrexham player." He also said re-uniting with Wilkin was a "key factor" in his decision. Moult was released by Stoke in June 2012 before joining Northampton Town. 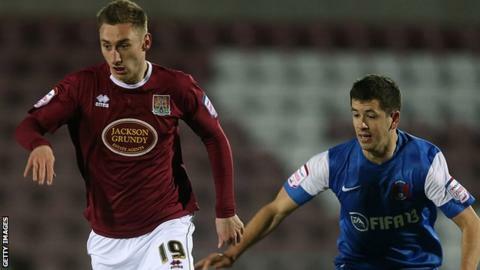 The Cobblers loaned him out to Nuneaton, whom he joined permanently in June 2013.